Custom built in 2009 by Wiggers Custom Yachts in Bowmanville Ontario, this masterpiece of Canadian yacht designer Mark Ellis was built to very high standards for the discriminating buyer. Top quality finishing on deck and below make this rare Canadian classic a much sought after vessel on both sides of the border. Roomy and designed for single handing, the 33 is an ideal yacht for the world’s best cruising waters. The like-new condition of the boat literally screams pride of ownership. Only a few overnight trips ever so the whole boat is like new with only 100 hours on the Yanmar engine. The navigation equipment has been replaced or updated by the current owners and Osprey is ready for many more years of enjoyable cruising. 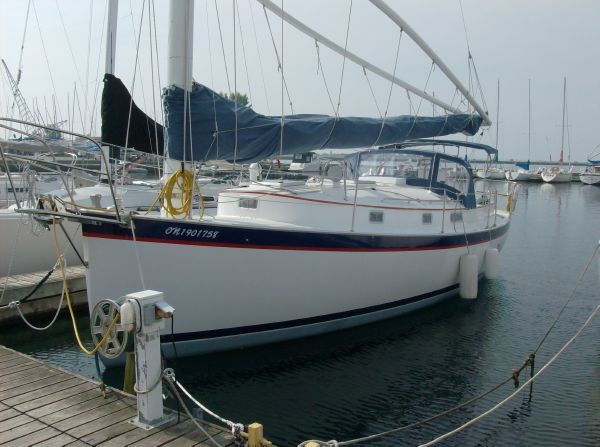 Osprey can be sailed single-handed from her deep, comfortable cockpit with only one halyard on an electric winch to raise or lower the sail, one sheet to control boom position, and a choker line to fine-tune sail shape for maximum efficiency. With a 31’ 6” waterline and huge single sail, she is extremely fast. Under power, a sail drive with fuel-efficient feathering Variprop provides great stopping power and the ability to reverse without the prop-walk typical of a traditional fixed-blade propeller. The cockpit is equipped with pedestal steering and stadium seating aft for great visibility underway, and there is a full array of updated Raymarine electronics including autopilot and radar for extended coastal cruising. Topside, wide non-skid side decks run unobstructed from bow to stern with double lifelines for added crew safety on those rare occasions where it’s necessary to go forward. Below decks, a 12’ 6” beam and 6’ 6” headroom make for a cavernous interior and a sense of roominess normally found in much larger vessels. The mast is positioned well forward so it does not encumber the saloon or master suite. Opening portlights and overhead hatches provide bright, airy cabin spaces with beautiful teak cabinetry, classic wood accents and teak and holly flooring throughout. The master suite has a double berth, plenty of storage and en-suite access to the head and shower area, while the quarter berth aft provides a second sleeping area for two. Port-side, a U-shaped dinette seats up to eight, and a starboard-side settee opposite seats two in comfort with storage below. The galley is positioned at the companionway for easy access, and is well appointed with ample storage, solid surface countertops and deep stainless steel sinks. Osprey’s cruising to date has been limited to freshwater (Great Lakes) and she is in exceptional overall condition. As one of only six custom built Nonesuch 33’s to be produced by Wiggers since Hinterhoeller ceased production in 1996, she is an extremely rare find. Quite simply, boats of this caliber rarely come on the market, and when they do, tend to get snapped up very quickly. Don’t miss this opportunity to own a very unique and highly sought-after sailing masterpiece.